This will likely be my last post about Venezuela — last but not least, though. Our trip to the Orinoco River delta was definitely the high point of the trip. Originally C. and I had just planned to hang out on the beach: on Margarita Island (pop. 100,000, a “free port” with hotels and bars) and Los Roques (pop. 5,000, an archipelago of sandy coral reef islands). However Los Roques proved tough to get to — you can only take charter flights, and one of the two airlines had been closed for inspections. So we made a spur-of-the-moment decision to hit the jungle instead of the beach — and were glad we did. We went on a tour organized by the Orinoco Delta Lodge (I’m not getting any kickbacks or anything to promote them. This was a new two-day tour that had been only running two weeks and involved squeezing in most of the normal activities from their four-day tour. Their driver picked us up at 4:45 a.m.! But it was all worth it. The river delta was a fascinating place. 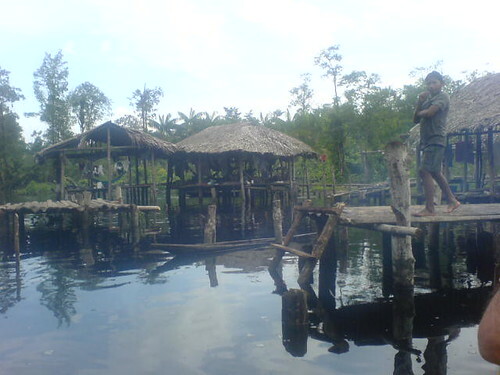 And the neatest part was the visiting the Warao Indians, this indigenous river people of about 25,000 that live on the delta at the intersection of modernity and primitivism. 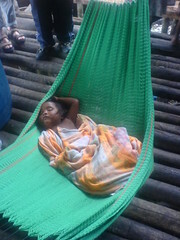 We visited with them and bought some of their braclets and balsa wood carvings for a few thousand Bolivars. (a couple US dollars). The floor of their huts are just wooden slats. We were warned to be careful not to stand on a slat where someone else was standing, else it could break and we’d fall into the river. But as you can see, they have some modern amenities like fuel tanks. C. and I posed with this teenager, who was wearing a “New York” shirt in the jungle. Slightly surreal. 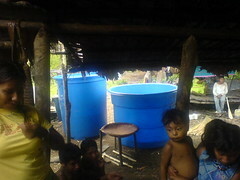 The government recently gave the Indians some big plastic vats for water storage, as well as some outboard motors. I’m told this has made a big improvement in their lives — during seasons when the river is salty, finding potable water can be tough. 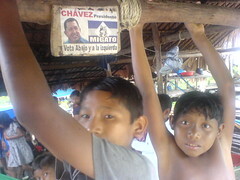 In return (I think) there was a Chavez sign nailed to the roof of the hut. The Warao do vote! We encountered this guy a little ways into the jungle with his mate. He is holding a single-shot rifle that the Indians make locally. They were out tracking a white boar through the jungle, supposedly. He was wearing shoes; she wasn’t. 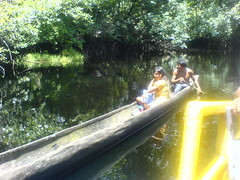 They traverse the river delta in canoes like this one. The canoes are carved from tree-trunks and then burned to allow the Warao to open them enough to sit in. A canoe might last about five years. We saw more of the Warao Indians at Pedernales, a one-car fishing village of about 800 or so we visited. It was neat to walk around and see people — everyone was very friendly. But many of the Warao have been attracted to this small outpost of civilization and live on its outskirts in shanties — huts that lack walls or toilets or trash cans. They do have electricity for TV and DVD players, though. There’s a school for children, but they don’t have to attend. It was an interesting glimpse at another culture, but there was a certain lack of industriousness about the village that both C. and I found slightly disturbing. Many days, I wish I were living in a thatched hut along the river too. That’d get old after like a day or so. The cool thing to do would be to be a bartender at the “lodge” where we stayed the night. 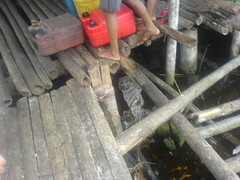 It was right on the water, basically on the dock, made with the same wooden construction style as the huts you see in the pics. Our bartender was this young European woman who’d been working there for a couple weeks — I don’t think she got paid, but got free food and lodging and tips. She said it’d be “like paradise” except there was no Internet. If you didn’t have a toilet to poop in, you wouldn’t want to work either! You think? I hope I’d build a toilet. And truth be told, I’m not sure where they did their business — there wasn’t any sewage strench or anything. I don’t want to, y’know, poop all over their culture… but I want to be honest in telling you my reaction as well. Enjoyed the pictures. I worked two years in Pedernales back in 1994. I was on an offshore drilling rig drilling across the river. We hired almost all the men in Pedernales. 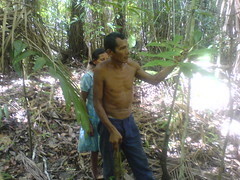 I toured around all over the Jungle there with the locals. It’s hard for pictures to do the place justice, It is beautiful! The people were incrediable also.